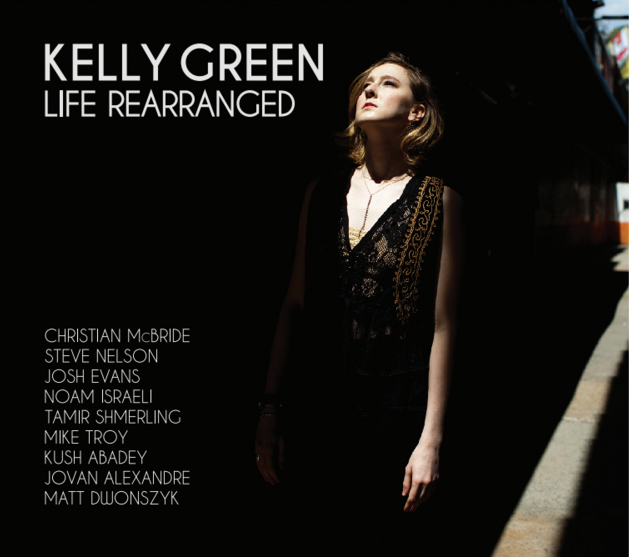 The sound of a siren in passing traffic opens pianist/singer Kelly Green’s new album Life Rearranged, streaming at Spotify. In addition to a mix of standards, some striking originals with flashes of greatness pervade this urbane, classy, purist album: Green is someone to keep your eye on. The material is typically on the melancholy side but with occasional wistful humor. Vocally, Sarah Vaughan seems to be an obvious influence; on the keys, Green plays with a strong sense for space and a flair for the unexpected. She and her group are playing the album release show on Dec 13 at 10:30 PM at Smalls; cover is $20 and includes a drink. The spaciously forlorn opening track is just piano and vocals, a jazz tone poem of sorts until Jonathan Barber’s rustling drums finally come in at the very end before a coda that’s too pricelessly apt and instantly identifiably New York to give away. It’s a good start. Green’s voice takes on a knowing, resolutely insistent Sarah Vaughan-esque tone in Never Will I Marry, Josh Evans’ trumpet and Green’s judicious piano punctuating this swing shuffle. That similarly emphatic vocal delivery contrasts with her pointillistically striking piano in I’ll Know, Christian McBride’s subtle bass slipping in at the end. Vibraphonist Steve Nelson adds sunburst and then dapple to Little Daffodil as Green and the band artfully shift meters. A strikingly acerbic, rainy-day chart – Evans and Mike Troy on alto sax – shade the instrumental ballad If You Thought to Ask Me before Green’s spare, poignant piano enters the picture, followed by a moody muted trumpet solo and a vividly cautious bass solo. Likewise, the horns fuel the harried, noirish bustle of Culture Shock, Green’s emphatic swipes anchoring whose balloon-in-the-wind alto solo. The album’s most epic track, the band descends into dissociative Sketches of Spain allusions and flutter loosely to a tightly wound drums solo before jumping back into the rat race again. Evans’ haggard, frenetic modes and ripples bring the intensity upward as the melody grows more Middle Eastern. Green’s take of I Should Care plays up the lyrics’ resolute irony, matched by McBride’s playfully dancing bass solo and Green’s carefree ornamentation on the 88s. In the same vein, Sunday in New York becomes a vehicle for both Green’s jaunty, irrepressible vocals and hard-hitting piano, McBride again capping everything off on a high note. Simple Feelings/The Truth is a darkly lustrous, distantly latin-tinged midtempo postbop number, building from austere and ambered to a lively sax/trumpet interweave. Green brings the lights down for a dreamy piano/vibes/vocals take of If I’m Lucky, followed by the scrambling All of You, Troy’s alto scampering through the storm. Green reprises the title track at the album’s end as a full-scale instrumental theme with solos all around and a wry trumpet quote or two. On one hand, it’s great that she has her vocal side: there are unlimited gigs for that. What’s most auspicious is her own compositions, and the outside-the-box sensibility that pervades them. Champian Fulton did an all-instrumental album: maybe Green should be next.